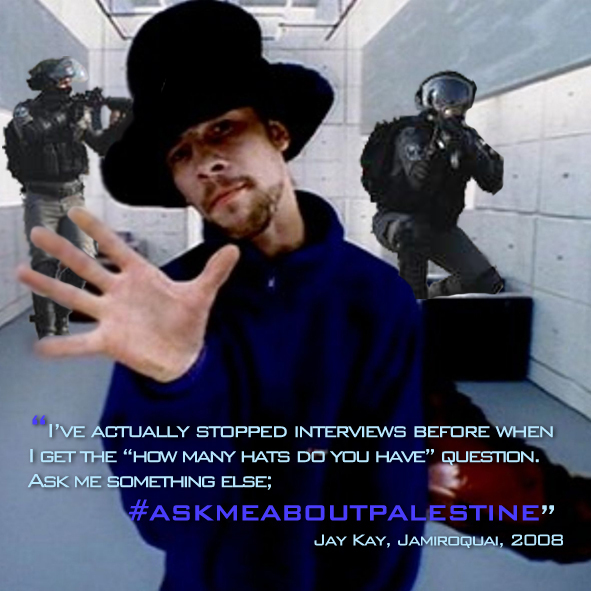 From Citizens of Israel to Jamiroquai: We're Asking You About the Situation in Palestine | BOYCOTT! We are citizens of Israel who oppose our government’s policies of colonialism, military occupation and apartheid against the indigenous Palestinian people . We write to you in support of the Palestinian call for boycott, divestment, and sanctions (BDS) against Israeli institutions , and specifically the call for an academic and cultural boycott . We write to you to do just that. We ask you to engage in conversation with us about the situation in Palestine, and respect the Palestinian call for solidarity by canceling your concert in Israel. This being your first concert in Israel, we wish to draw your attention to Israel’s systematic human rights violations in the Gaza Strip and the West Bank, under its military regime, which amount to war crimes under international law. But let us start by talking about the human rights violations which Israel commits within Israel itself. The city of Tel Aviv, just like Sun City in South Africa under the apartheid regime, is used as a facade for marketing Israel as a “cool” and “cultured” democracy, while practicing a decades-long policy of discrimination and ethnic cleansing. After the creation of Israel in 1948, Tel Aviv swallowed Jaffa under its municipality, expelling the majority of its residents, demolishing indigenous architecture, and - what it called- “Judaising” the city . There are over 1.7 million indigenous Palestinians citizens of Israel, who make up over 20% of the population, and are subject to a system of over 60 discriminatory laws . Individual-based separation of families is a fundamental method of displacement , along with decades-long processes of systematic impoverishment, de-development, gentrification, and ghettoisation . The situation is so bad that the infant mortality rate among Palestinian residents of Jaffa is four times higher than that of the Jewish residents of the city. This is higher than the average in the rest of Israel, where Palestinian citizen infant mortality rate is three times that of Israel’s Jewish citizens. Israel’s own Ministry of Health attributes this to the impoverishment among the Palestinian communities in Israel . The Israeli army's command and control center - known as "Ha-Kirya" - is situated in the heart of Tel Aviv, and serves as the headquarters for Israel's military occupation, population control, and massacres of the Palestinian people in the West Bank and Gaza. Since October of 2015, Israel has extrajudicially executed hundreds of Palestinians in the streets of the West Bank. Approximately 29% of them were children . Mass arrests continue, and there are over 6000 Palestinians in Israel’s prisons at any given time, including an average of 250-350 child prisoners, and over 400 prisoners held without charge, trial, or release date . All Palestinian prisoners in Israel's prisons are subjected to systemic ill-treatment, medical neglect, beatings, and torture . Israel’s mass house demolitions of Palestinian homes and property has doubled since last year, including whole villages, leaving over a thousand people homeless, over half of them children . Meanwhile the replacement of the indigenous population with Jewish-only colonial settlements has doubled in the past year . Gaza is under its 11th year of debilitating siege, under routine military attacks; from firing at agricultural workers from both land and sea, to periodical bombings, and the constant overhead buzzing of drones . Two million people- over 50% of them children- crammed into less than 365 square kilometers, with power outages of up to several days at a time in some neighborhoods. 97% of the water is undrinkable , civilian infrastructure has been devastated; including hospitals, schools, places of worship, businesses, and public institutions . As of February 2018 Gaza’s hospitals are reliant on emergency generators and are out of stock of life saving medicines, leaving hundreds under the threat of immediate death. 19 healthcare facilities, including 2 hospitals, have shut down in February 2018, due to lack of fuel. The World Health Organization reports that more than 1.27 million people in the Gaza Strip are in need of critical lifesaving health services in 2018 . Over 80% of Gaza's population rely on humanitarian aid to cover their very basic needs; including food, basic education, basic healthcare, shelter, blankets, mattresses, and cooking stoves . The UN has admitted in July 2017 that despite its public predictions that Gaza will be 'unlivable' (meaning that there will effectively not be enough resources for people to survive) by 2020, it has in fact been unlivable for years. The only thing sustaining it are massive donation funds . Lastly, Israel denies Palestinian refugees their right to return to their homeland, in accordance with international law and resolutions , while continuing to seize their land, and expel them from their homes. In 2013, Jay Kay, you asked your fans to sign a petition to free Greenpeace’s imprisoned protesters jailed in Russia, and you wrote on your Facebook page: “It’s virtual insanity that these 30 people are facing such serious charges for peacefully protesting in the Arctic” . It is for all this that we ask you to stand in solidarity with the indigenous Palestinian people, and say “NO” to the whitewashing- through music- of apartheid. Please say "NO" to deliberate impoverishment, military occupation, and ethnic cleansing. Much like the Greenpeace protesters, The BDS campaign, by human rights defenders, needs your solidarity. We ask that you cancel your concert in Israel. Let’s talk about the situation in Palestine.